Dr. Borrows, B.A., M.A., J.D., LL.M. (Toronto), Ph.D. (Osgoode Hall Law School), LL.D. (Hons. 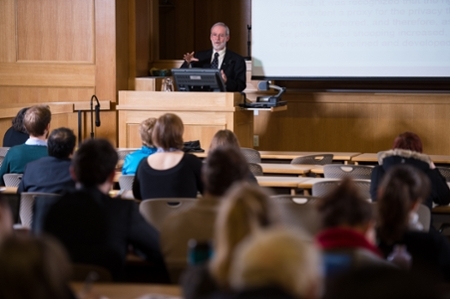 )(Dalhousie) F.R.S.C, teaches in the areas of constitutional law, indigenous law and environmental law at the University of Victoria Law School. His publications include Canada's Indigenous Constitution (Canadian Law and Society Best Book Award 2011); Drawing Out Law: A Spirit's Guide; and Recovering Canada: The Resurgence of Indigenous Law (Donald Smiley Award for the best book in Canadian Political Science, 2002). He has been adorned with several awards including the Aboriginal Achievement Award in Law and Justice, a Fellow of the Trudeau Foundation, and a Fellow of the Academy of Arts, Humanities and Sciences of Canada, Canada's highest academic honor. In 2012, he was the recipient of the Indigenous Peoples Counsel award from the Indigenous Bar Association, for honor and integrity in service to Indigenous communities. Professor Borrows is Anishinabe/Ojibway and a member of the Chippewa of the Nawash First Nation in Ont., Canada. The Ivan C. Rand lecture is a memorial lecture that started to honour the memory of jurist, scholar, public servant and educator Ivan Clevland Rand. Dr. Rand was a towering figure in the life of the Law of Canada during the crucial middle decades of the twentieth century. Trained at Harvard before the First World War, he was catapulted onto the national stage in the midst of the Second World War with his appointment to the Supreme Court of Canada. This followed 25 years of distinguished practice, particularly as counsel to the Canadian National Railway. In court, Rand demonstrated intellectual depth and adherence to principle in a body of timeless judgments rendered from 1943 to 1949. Rand also engaged in important acts of public service as a royal commissioner and as an arbitrator. In his later life, Rand became the dean of law at the University of Western Ontario and was a Visiting Professor at the University of New Brunswick. Panel: Implementing the Truth & Reconciliation Commission Recommendations on Wednesday, March 2, 1 p.m. - 2:30 p.m. in the Mary Louise Lynch Room, Ludlow Hall, UNB Fredericton. Panelists include Karen Drake, assistant professor at Lakehead University’s Bora Laskin Faculty of Law, Stephen Augustine, dean of Cape Breton University’s Unama'ki College and Aboriginal Learning and David Perley, director of UNB’s Mi’kmaq-Wolastoqey Centre. The Panel will be moderated by Graydon Nicholas, former Lieutenant-Governor of New Brunswick, and Imelda Perley, UNB’s Elder-in-Residence will deliver the official welcome. James [Sákéj] Youngblood Henderson, research fellow at the University of Saskatchewan’s Native Law Centre of Canada. All events on Mar. 2-3 are open to the public. The John Borrows lecture on Wednesday, Mar. 2, at 5:30 p.m. will be followed by a reception in the Student Lounge.